The Israel Mission to the UN has formally requested that the UN Office for the Coordination of Humanitarian Affairs (OCHA) fire its national officer in Jerusalem, Khulood Badawi, due to her blatant anti-Israel activism, Fox News reported over the weekend. Last week, the report said, Badawi used Twitter to send a picture of a bloodied child in her father’s arms with a caption: "Palestine is bleeding. Another child killed by Israel. Another father carrying a child into a grave in Gaza." The Twitter message, which was a huge hit, claimed that the Palestinian girl had died from an Israeli airstrike the day before, but an Israeli examination of this claim found that the girl was killed in a car accident in 2006. Fox News further reported that several pro-Palestinian websites have come to Badawi's defense, including Alternative News, which posted a petition to save her job. 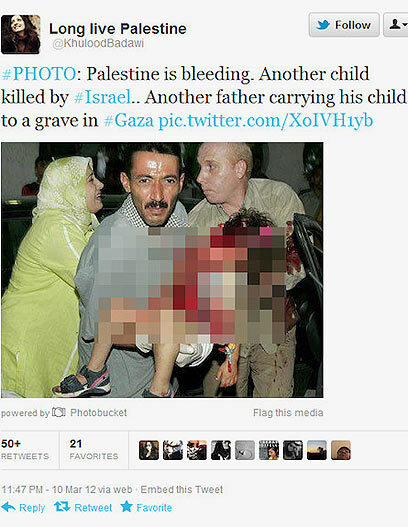 See all talkbacks "Israel to UN: Fire worker over false Gaza Tweet"